But here are two products that work for any skin type. I list them at “budget” because they’re very reasonably priced, but I’d use them even if I wasn’t cost-conscious. Everyday Shea’s bubble bath “for babies and up” is made with truly all-natural ingredients, is fair-trade certified and contains shea butter to gently moisturize. It’s phthalate-free and packaged in a PVC- and BPA-free bottle–although at 32 oz, it’s more like a jug. It costs approximately $10, but you can occasionally find it for as little as $7. I like the “calming” scent, which contains lavender and lemon (because I like the idea of winding down my little ones before bed instead of amping them up). It also comes in “comforting” eucalyptus mint, which seems appropriate to use when your little one is feeling under the weather. There is also an “adult” version available in three scents, including unscented for those with extra-sensitive skin. 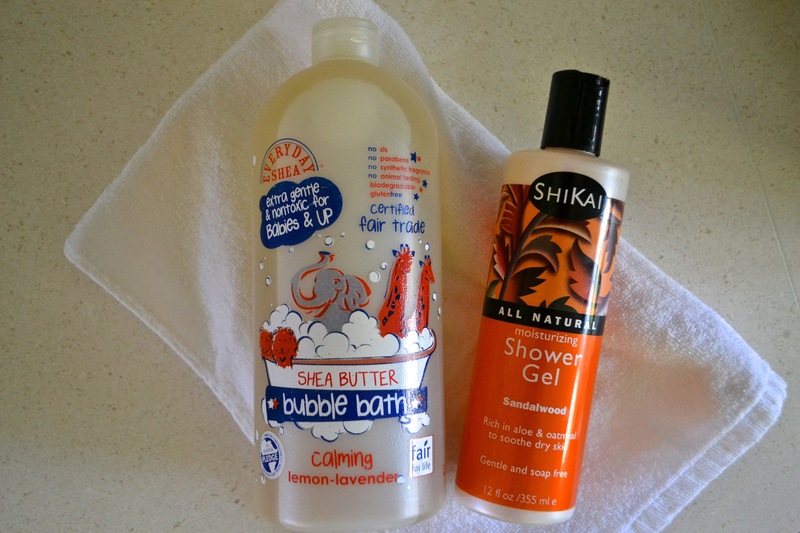 Moving from the bath to the shower, my personal favorite is Shikai’s All Natural, Moisturizing Shower Gel, $6-$10 for 12 oz. There are nine scents available: Cucumber Melon, Vanilla, Yuzu, Sandalwood (my favorite! ), Pomegranate, Honeysuckle, Starfruit, Gardenia and Coconut–all of which are pretty amazing. A comment about sandalwood… Years ago–at least 20, a colleague from India traveled to his home country for work and brought back a small gift for me: a letter opener made from sandalwood. I remember smelling the incredible scent even before I had unwrapped the paper covering the small wooden knife. I still have it to this day, and remarkably, it still smells amazing, just far less strong. As many of you know, I “vet” all my products with the Environmental Working Group before recommending them, so you can imagine my shock and dismay when I read that the EWG gave my beloved Shikai shower gel a “5” (moderate hazard) because one of the ingredients it contains–cocoamide DEA, is rated as a high hazard due to issues with (non-reproductive) organ toxicity from contamination. Evidently cocamide DEA, although naturally-derived from coconut oil, is chemically-modified. Naturally, I immediately contacted Shikai. A company representative immediately followed-up and assured me that they have been aware of the issue and have pulled all product containing cocamide DEA from their distribution centers. Furthermore, the new formulation does not contain this potentially hazardous ingredient. The Shikai representative also told me that eight out of their nine scented shower gels use only natural essential oils for fragrance, but that the sandalwood uses a “tiny amount of chemical fragrance to boost the natural sandalwood scent.” Since it’s a product you rinse off immediately (unlike lotion or a facial mask), I will happily keep using this wonderfully-smelling, very moisturizing shower gel.